Erlinda Llana Balagot fought the good fight and reposed with succor during a balmy, early afternoon on May 19, 2017. She was closely surrounded by loved ones and family and will be sorely missed. Harrowing a furtive struggle, Mom remained spirited and graceful afterwards. Born in La Union, Philippines on August 22, 1945, her late father and surviving mother moved to Laguna, Manila towards the end of World War II occupation. 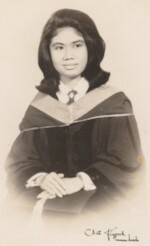 Growing up near the capital, Erlinda graduated with a Commerce Bachelor Degree in Accounting, married her sweetheart, Romeo G. Balagot, Sr., and raised her first two children. In 1975, her husband gained citizenship to the United States, and she agreed to emigrate, having another son in Seattle in 1978. Both eventually found positions at Metro, the Municipality of Metropolitan Seattle, which later was consolidated into King County. Linda retired in 2005 and enjoyed the company of two grandsons, family, and friends. She enjoyed keeping informed of all her loved ones and had a flair at keeping adept of all her favorite celebrities through her entertainment magazines! Mom had those bygone, timeless ways, but her joie de vivre and experienced memories will always be treasured. She is survived by her husband, daughter Maria, and sons Ronald and Romeo Jr., along with loving, extended family and friends. 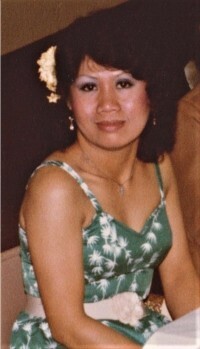 In September, Erlinda will be interred in Calvary Cemetery in Seattle with family. 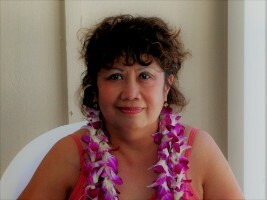 Balagot family, I'm so very sorry to learn of Erlinda's passing. She will truly be missed. Romeo, I know you can remember me. I am Lettty the cousin of Linda and Manong Abe and Manong Esco. I am going over the computer and Linda was in my minattle I ed for quite a week now ,so I became curious and tried to find her here in the computer and just discovered that she had joined the Lord. I was so sorry to learn that. How are you now? Can you contact me with my email? quinto leticia098@yahoo.com so we can talk. I am teaching here in Alaska and every time I go to Seattle she It reminds me of her. You know we are one of the closest.